Valentines Day - It Doesn't have to be about Chocolate! A kindergarten Valentine’s Day party is one of my earliest happy memories, and I can still feel the excitement and joy! Who can forget decorating a beautiful box with a slit on top with red and pink colored paper and doilies all done up, spending hours choosing cards to give, carefully picking just the right card for each kid in your class, signing them with proper penmanship, and looking forward to the school party with those special cupcakes covered with little candy hearts that said how cool you were! Life was sweet at five! 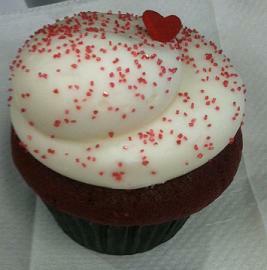 Pictured Above: A Valentine's Cupcake made by my niece Amanda Smith. Named after several early Christian martyrs named Valentine and established in 496 AD. It did not become associated with “romance” until the Middle Ages! Geoffrey Chaucer wrote the poem, "For this was Saint Valentine’s Day, when every bird cometh there to choose his mate", to honor King Richard II of England and Anne of Bohemia. During this time, young men and women would draw names from a bowl to see who their Valentine would be. They would wear their names on their sleeve for one week. Symbols of the holiday are heart shapes, Cupid, doves, candy, flowers, greeting cards, cupcakes, and anything red or pink!!! In 1797, "The Young Man’s Valentine Writer" was published, which contained many verses for lovers to use who could not develop their own sentiments. Valentine cards with verses became popular in the next 100 years, especially unsigned ones sent through the mail to your secret sweetheart. Cupid is the symbol of love. It is said that if Cupid shoots his arrow of love and it hits you, that you will fall madly in love with the next person that you meet! Watch out! Paper Valentines were mass produced in the early 19th century and morphed into ones made with real lace and fancy ribbons. Today, handwritten notes have given way to mass produced cards, and all kinds of gifts. Roses, chocolates in heart shaped boxes, and jewelry; nothing is too small for your sweetie! Over one billion Valentines are exchanged each year in the United States, given not just to sweethearts, but family members, kids, friends and classmates. The sentiment expressed is appreciation! The internet has allowed a new way of showing love: e-cards, or printable greeting cards. Over 15 million e-cards were sent in 2010! 189 million stems of roses are sold in the U.S. on February 14th! Red roses are traditional for true love! Better know this one guys! The holiday has become completely commercialized! Caring can’t be purchased for money. Some of the best gifts are hugs and simply saying, "I love you"! Love Never Fails by Brandon Heath! Food Substitutions for Chocolate, Chocolate, and more Chocolate! This year 35 million heart shaped boxes of chocolate will be sold, but you must tango for 16 hours to burn off the calories! A box of 25 truffles will set you back around 3250 calories! Try: 1 cup coconut milk ice cream, 1 cup raspberries, and 2 T sliced almonds for 270 calories! Try: A fruit parfait of 1 cup fresh strawberries, 6 oz nonfat Greek Yogurt, topped with 2 T dark chocolate chunks for 200 calories! Try: 1 cup of fruit to dip in ¼ cup melted dark chocolate for around 180 calories. Try: Large Strawberries dipped in dark chocolate for 74 calories for 2 of them. Try: 10 raspberries with 1/8 cup of light whipped topping for 54 calories! Treats for kids parties would be: strawberries and dried apricots dipped in dark chocolate, large pretzel sticks dipped in chocolate, smoothies made with low fat yogurt and fruit, fruit skewers with strawberry yogurt dip, or make a veggie tray in a heart shape surrounded by mini tomatoes, heart shaped peanut butter and strawberry jam sandwiches, or non food options. Holidays have become overly commercialized and centered on processed candy, sweets and other stuff! 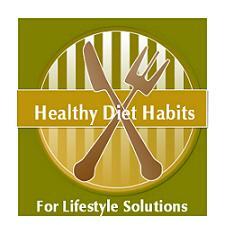 Simplify the season and develop healthy diet habits for your love of chocolate! A little great chocolate with fruit goes a long way! 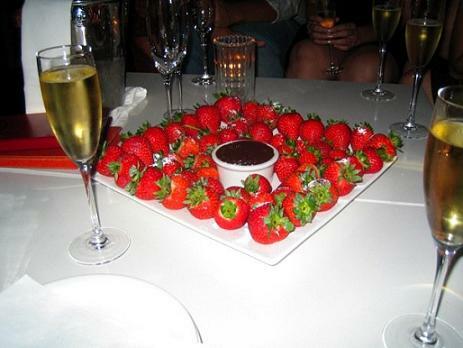 Strawberries dipped in chocolate can make you the hit of any party you attend, especially if you are a guy! A simple hug and an "I love you" can mean more than any store bought toy, or piece of jewelry! Flowers though are a must for all!